Madagascar is home to as many as 12,000 plant species -- 70-80% of which are endemic -- making it one of the most diverse floras on the planet. One of Madagascar's most famous plants is the baobab tree which looks like a tree growing upside down. 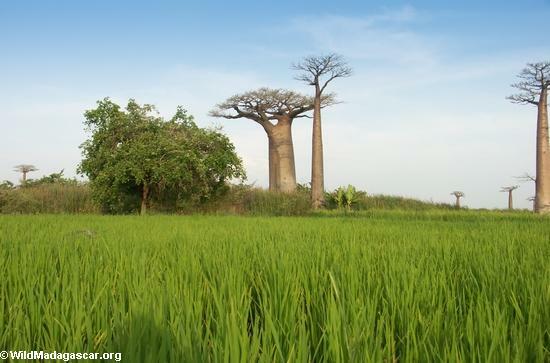 Baobabs usually inhabit the drier parts of Madagascar. They have adapted to their environment by storing large amounts of water in their bulbous trunks ecosystem. Local Malagasy take advantage of this water reservoir when they are thirsty. Madagascar is also home to a totally unique ecosystem -- one that is found nowhere else on Earth. Found in the dry southwestern part of the island, the spiny forest is notable because virtually every species of plant is covered with sharp spines. While these plants look a bit like cactus, they are not related. About 95% of the species found in the Spiny Desert are endemic. Madagascar has nearly 1000 known species of orchids, of which 85% are endemic. One of Madagascar's plants is used as a cure for cancer. The rosy periwinkle has been used to treat Hodgkin's lymphoma and childhood leukemia.